BIRMINGHAM, Ala. – Doxorubicin is a chemotherapy drug widely used in ovarian, bladder, lung, thyroid and stomach cancers, but it carries a harmful side effect. The drug causes a dose-dependent heart toxicity that can lead to congestive heart failure. University of Alabama at Birmingham researchers now describe an important contributor to that heart pathology — disruption of the metabolism that controls immune responses in the spleen and heart. These immune responses are vital for heart maintenance, repair and control of inflammation. This dysregulated immunometabolism impairs resolution of inflammation, and chronic, non-resolving inflammation leads to advanced heart failure. Immunometabolism is the study of how metabolism regulates immune cell function, and it is a recent and growing aspect of immunology. Two key players in immunometabolism are immune-responsive enzymes called lipoxygenases and cyclooxygenases. These immune-sensitive enzymes create a variety of bioactive lipid mediators that regulate immune cell responses. 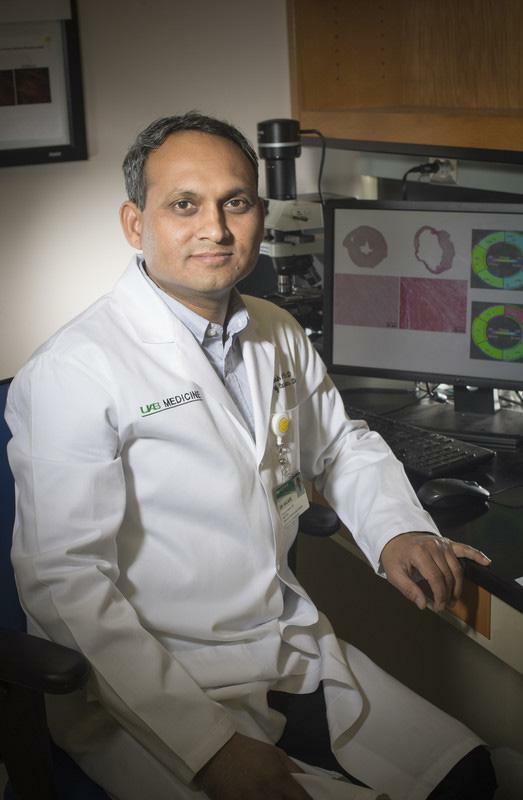 The UAB researchers, led by Ganesh Halade, Ph.D., an assistant professor in the UAB Department of Medicine's Division of Cardiovascular Disease, used a mouse model to study the effect of doxorubicin on immunometabolism. In the mice, doxorubicin induced fibrosis in the heart, increased the programmed cell death called apoptosis and impaired the pumping of the heart. The drug also caused a wasting syndrome in the heart and the spleen. Mounting research has shown that the spleen — which acts as a reservoir of immune cells that speed to the site of heart injury to begin clearance of damaged tissue — plays a leading role in the initiation of immune response after a heart attack. Now, Halade and colleagues have found that the doxorubicin is also involved in the deleterious response to the spleen. First, the UAB researchers found that doxorubicin induced irreversible dysregulation that lowered levels of lipoxygenases and cyclooxygenases in the left ventricle of the heart. This reduced the levels of bioactive lipids mediators produced by these enzymes, mediators that usually would help resolve inflammation. Second, in the spleen, doxorubicin also poisoned a special group of marginal zone immune cells called CD169+ macrophages, causing the spleen to diminish in size. This loss of specialized macrophages means an impaired host defense system because these unique macrophages usually coordinate the first-responders monocyte deployment plan to sites of injury or infection in order to synthesize bioactive lipids to activate the resolution of inflammation. Third, doxorubicin caused an imbalance of the cell-signaling molecules called chemokines and cytokines, and this imbalance suggests suppressed defense capacity of spleen-leukocyte immune cells. Specifically, the researchers found decreased levels of tumor necrosis factor-alpha in the spleen, and they found decreased levels of the immune-cells reparative marker MRC-1, also known as CD206, in the heart. Thus, Halade says, doxorubicin appears to have a splenocardiac impact in this non-cancer model. Knowledge of this mechanism may help explore strategies that will preserve spleen and heart health during doxorubicin treatment in cancer models. Co-authors with Halade of the paper, "Doxorubicin triggers splenic contraction and irreversible dysregulation of COX and LOX that alters inflammation-resolution program in the myocardium," published in the journal in American Journal of Physiology-Heart and Circulatory Physiology, are Jeevan Kumar Jadapalli, Griffin W. Wright and Vasundhara Kain, Division of Cardiovascular Disease, UAB Department of Medicine; and Mohammad Asif Sherwani and Nabiha Yusuf, UAB Department of Dermatology. Support for research was provided by National Institutes of Health grant HL132989 and a UAB Pittman Scholar Award.